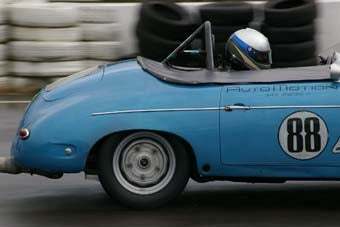 Invasion Of The Porsche 356 Racers! Pacific Northewest-based race photographer and Datsun 510 racer VintageRacer has continued to send us plenty of great action shots, and now it's time to share a few. We race a Datsun 510, and the 510 has a great race heritage, but I do like the 356. The only problem is that there's just so many of the damn things! Both of these cars will be at the Historics - the featured marque is Porsche). The white one is owned by Woody Perkins, the yellow by Tom Hedges (who also owns Hedges Winery up here in Washington). If I remember correctly, they both bought them around the same time - roughly 3 years ago. They run them up and down the West Coast.